Good in parts. 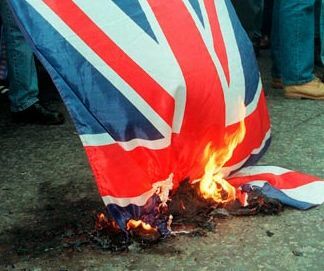 My blogging peer, as ever, writes with passion and concern for our Western Democratic failure and how politics, in all its failed awfulness, now dominates our lives. 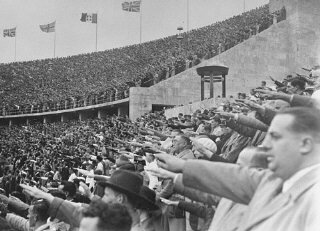 Just as in 1936 the London Olympic are a vehicle for the powerful and an ego trip for the weak and feeble in authority. Now for me there are things I am enjoying. The British teams and competitors are doing OK. In my beloved sport of cycling, brilliantly. To see a British soccer team doing well is enjoyable and I believe well worth the effort of getting together. Naturally the turnip heads have shown their ignorance of history in ignoring the anthem but there we go again, politics enters even the thick headed cuckolders. Yet when I think of the corruption that is endemic in the Global Quango establishments, as well as National, I cringe. The IOC compete heavily with FIFA to determine who gets the biggest kick backs, the best hotels and the most frequented palaces. Sickening. Note how, also, a real sport like squash is sidelined in favour of beach volleyball, for goodness sake. Of course the latter is just to service the leering hordes of IOC officials and their pals, as well as sell tickets for a puerile more advanced Frisbee game. The absence of a beach seemingly irrelevant. I don't see why they don't have "air" table tennis as a sport. Then, as JW points out, more fluently than I, the hijacking of the Games for PR and photo opportunities is like 1936. Cameron turning up to do a Snotty like jinx performance. Now hiding behind screens and only popping out when sure of reflected glory. Far more important than monitoring the Syrian conflict and other less important issues for which I always thought we paid him for. Silly me, shagging the red haired temptress, leaving his kids behind, hoping they might be kidnapped and pretending Wiggo only wins 'cos he's PM are his first priorities. Safe for our streets? I think not. So, good in a few parts but mainly boring, minor sport, endless gushing sycophancy and awfulness. All this underpinned by the grubby smugness and opportunism of the BBC. You know, I think I enjoyed The Tour De France far more. A spectacle dominated by the spectators along the roadsides. Many thousands, in the main, enthusiastic, non ticket holders, relishing three weeks of virtually free entertainment. A population enjoying themselves secure in the knowledge that if their politicos go just a bit too far they will suffer. In France the spirit of revolution is never far away. Love it or hate it, it's a freer spirit than we possess. Ironic they may well save us from The EU. Rather a shame the Games didn't go to Paris. Still, the velodrome wheels off later. Nearly as good as the Tour and road racing!